Wit and wisdom are the greatest assets one can have. We often used to hear “Knowledge is the power”, which is absolutely correct. But to use the right piece of knowledge at right place and right time, is something more important than just having possession of the knowledge. Probably that is the reason older man’s wisdom is referred not the cleverness. Knife can be used to cut or cut through anything that is what we can say “knowledge”, how to use knife for positive purpose and not for any anti-human or anti-social stuff is the “wisdom”. We – the humans – have the incredible asset called brain, which can hold a lot of knowledge and wisdom both. So we know what to do at the specific time. Though you also have heard that “Commonsense is very uncommon”, fun apart, but this is the truth. We often see people using their knowledge at wrong place or time. The aim of establishing schools are giving the growing humans, the wisdom in-forced with the knowledge. That’s the reason, the lifespan is classified into 4 different segments. From which, the first segment is, to get prepared with the education (in broad meaning). It all says that, we all know the importance of having knowledge and wisdom, and we arranged some great ways to provide the same treasure to all the humans at very first stage of the life. All of which seems very planned and perfect (of course it is); but still it is found very tough to follow the path always. There are various factors involved which may create hurdles when trying to implant this qualities into the kids. First and foremost, their inexperience. As they know from nothing to very little about the life, as they have not faced it yet. They are found not as serious to accept the qualities as much as the wise men are serious to implant the same into them. At the little age, children are mischievous and playful, and that the childhood, the carefree phase of the life. But at the same time, it is the right time to start the voyage of knowledge and wisdom. Another factor is the feelings of parents and other elders which lets them think that, let the child enjoy this period of childhood. They sometimes blinds their eyes towards some of the wrong things done by the children. Till mischievousness, its fine. But there must be a boundary that the kids should know. Of course the stuff should be gradually executed. Sometimes elders think there are plenty of time left for the child to know the stuff, and they will learn automatically with the age. The another factor is the availability of the valuables at ease for the children. The children need not to earn anything to get what they wanted. Which sometimes makes them ignoring the importance of several valuables. All these are the realities and of course the childhood is childhood, it must be for joys and fun, it cannot be ruined with loads of strictness. What is the solution then? Well it is hard to find and easy to get! Our ancestors who initiated the culture of Gurukul, have shown the way. Let the child be the child and enjoy the fun, as well let him know the responsibility. When they live in Gurukuls (we call it hostels nowadays, but they are not real Gurukuls); they have to do their daily works on their own, they need to do some other work (of course of their caliber) allotted to them and on the other end the Guru and his wife and their fellows showers them with love and never let them felt they are away of the family. The children got to have all the joy, fun and love of the life along with the education. Which arm themselves with the knowledge and the wisdom, to fought the battle of real life they need to face when grown up. In very old times, there was a King, who was very brave, kind and intelligent. For him, his entire kingdom was his family and he was taking care of all the citizens fondly. Since some of the days he was found dug into worries. Upon asking the reason behind his worries, by his ministers, he reveals that, what will happen of his kingdom after him. As he found none of his three prices capable of handling the kingdom. In fact they all lack wit, wisdom, knowledge any other qualities. Which are must for a king; because he have very large amount of responsibilities to care for. The king was unable to find any way to solve the problem. Then he was advised to contact Pt. Vishnu Sharma, one of the respected, saint like, teacher living in his kingdom. Who later on took the responsibility to educate all the prince. Pt. Vishnu Sharma have developed a very unique and effective way to do what he was intended for. He took the boys at his Ashram – Gurukul, far from the city – in the jungle, to keep them stay with him. He was used to tell a story with a moral daily, to the boys, and then ask them the moral of the story. Gradually the children got enthusiastic to solve the puzzle, to earn the real moral of the story, and thus getting the lesson of knowledge and wisdom. All the stories Pt. Vishnu Sharma told the student were very small and yet effective. 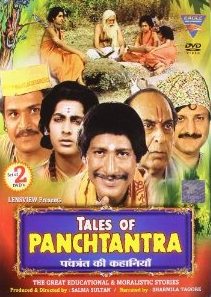 The collection of the stories is known as “PanchTantra”. The stories are heared the children of the modern generation during their childhood from elders and even the part of their text books also. Children enjoys hearing these stories and they are so effectively educates them that, it is also published as cartoons, comics TV serials, and even referred in the movies as well. So let’s explore “Panch-Tantra”, the ancient vault of wit, wisdom, knowledge and… lot more.